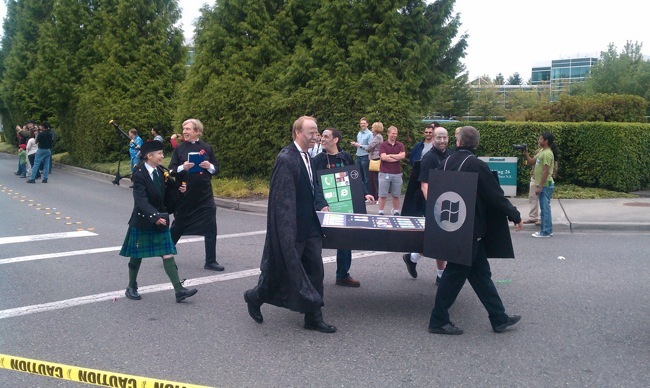 Solemnity was nowhere present last Friday when Microsoft employees trooped out of their cubicles at the Redmond campus for a funeral parade equal parts Halloween and geek Mardi Gras. Donning some of the kookiest outfits in the western hemisphere, zombies, sci-fi icons (Darth Vader) and different Village People impersonations were out in full force to “lament” the iPhone’s demise. In fact, most conspicuous among the participants were the iPhone and Blackberry mock-ups being carried coffin style to the grave. Having perused the pictorial evidence, we’re thinking both subtlety and taste weren’t in the order of the day when they pulled off this stunt. So what’s the big deal then? Not much, except Microsoft wanted to make a bold statement about the upcoming Windows Phone 7. In fact, to drive home the point about how much WP will trounce the competition, not only were they “buried” but one cheeky fellow carried a sign that read “Android Falling”. To cap it all off, the jolly Microsoft people broke into a scorching rendition of “Thriller”. Find this hard to believe? There are ample pics for proof, mind you. They were taken by some dude using an HTC Evo 4G Android phone. Go figure.